It offsets heavily, and forms a beautiful low white cushion. Pink flowers opens in late winter. 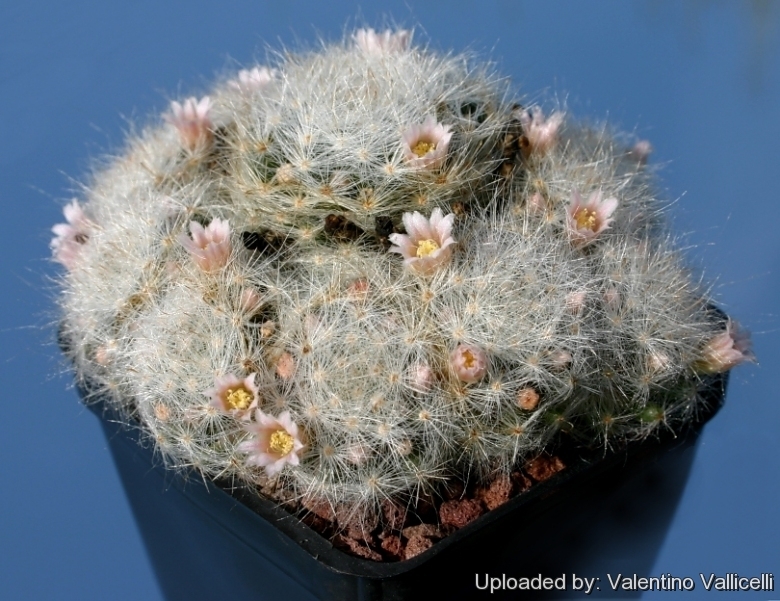 Habitat: Grows in moss on limestone mountains near Ascension, 2400 - 2.750 m.
Description: Mammillaria glassii var. 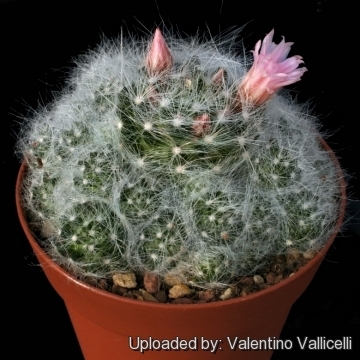 ascensionis is a controversial variety of Mammillaria glassii now reduced to synonym. It distinguish for its larger stems (up to 10 cm in diameter), axil almost naked with short wool and few (If any) bristles. Central spines 7-7 mm long, flowers larger up to 18-22 mm wide. Habit: It is a small free branching plant that forms low clusters or dense cushions. Individual stems are globose. Tubercles: Cylindrical with usually short white hairs and about 3-8 hairlike bristles in the axil up to 3-15 mm long. Central spines: 1 longer erect, straight or hooked, 5-7 mm long, white, brown on the tip, and 4 to 7 straight, 4-6 mm long, more or less orderly, dispersing to the sides, while difficult to distinguish from radials. Radial spines: 50-75, 4-14 mm long, , interlacing, hairlike, white. Fruits: 15-17 Long, 3-5 mm in diameter, greenish- white to pale pinkish-olive. Ripens about 3 months after flowering. Seeds: Pear-shaped, 1.2 X 1.0 mm, black. Remarks: Vaguely resembles Mammillaria prolifera. 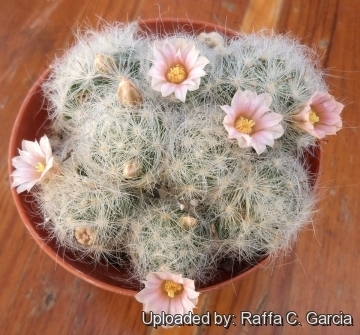 Glass and Foster consider it a variety of Mammillaria glassii. Cultivation and Propagation: Of easy culture and recommended for any collection, it doesn't requires any special treatment. It readily forms clumps of many small heads. 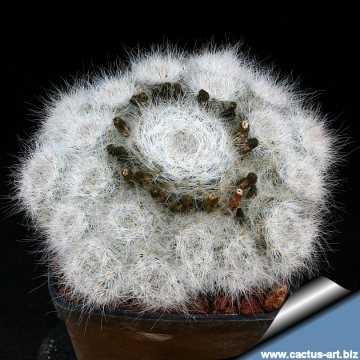 It needs as much light as possible without burning the plant, to encourage the heaviest spine formation. Growth and flowering are improved under these conditions. Use very gritty potting mix (rot prone) For best results, use a shallow pot, and only use the smallest diameter pot that will accommodate the plant. Regular water in summer, dry in winter. 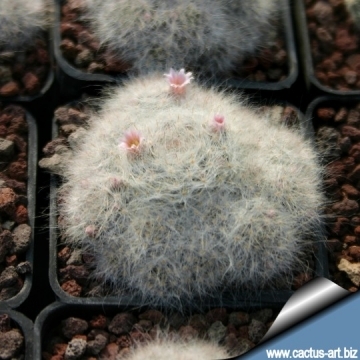 The use of a covering gravel is a good way to preserve the whiteness of spines. Frost tolerance -6° C.